I am grateful to one of my readers who alerted me to a fascinating web site www.whatdotheyknow.com which helps people to submit Freedom of Information requests to any public authority. In response to a question from a member of the public, Barnet Council published details of councillor expenses for the current financial year 2008/09. In 2007/08 council leader Mike Freer claimed £47,082. According to the latest figures, Mr Freer’s allowances for the current year 2008/09 are £51,109 - almost £1,000 per week. This is a rise of more than 8.5% - far and away in excess of the rate of inflation. But in percentage terms, it pales into insignificance when compared to Lynne Hillan (pictured right), who hopes to take over from Freer when he steps down as leader later this year. Her Barnet allowances rose from £30,298 to £34,559 - a thumping increase of more than 14%! Brian Coleman, no stranger to controversy, saw his Barnet council allowances rise by a modest 1% from £26,498 to £26,771. Deputy Leader Matthew Offord’s increased by 1.4% from £35,998 to £36,506. Some councillors saw their allowances drop, so it would be unfair to say that all of them are greedy. But councillors must demonstrate to the public precisely what they do for the money. It is not sufficient for them to say “we could earn five times as much in the private sector.” No you couldn’t, otherwise you would be there doing it. The economy is in terrible shape and we expect our leaders to lead by example and tighten their belts. We will soon know how much councillors propose to pay themselves from March. After the inflation busting increases given to Cllrs Freer and Hillan last year, is it too much to hope they will follow the example of some of their colleagues and take a cut? What is really unacceptable is that these Councillors, and the Council's ineffective 'Standards' Committee, have stuck two fingers up at the London Council's Independent Pay panel. They had, and emphatically still do, demand that all Councillors account publicly for their pay. Barnet refuses to do this; the voters are treated with contempt. A small start would be publishing their diaries and attendance at meetings. Attendance data is built in to the Council's computer systems but is turned off for the public. These two things could be enabled tomorrow, Cameron would do it - will Freer? Umm and did you ever turn up to EVERYTHING Daniel... NO but you gladly took the pay. Hello pot this is kettle calling! And how much does Mummy earn in aloowances for being in the Lords... ummm I wonder! Hey Crack Dave, I'm sure you are going to substantiate your claim so I'll wait for you to list any meetings that I missed. In fact I think you'll find that if you took away the few meetings that I was not present at over four years and add the extra meetings I attended covering for others, it could be over 100%. Here is evidence to support my assertion about the ineffective Standards Committee which is the only Committee responsible for the ethics of the Council. These are replies to public questions. What has the Standards Committee done to ensure that high standards of conduct are promoted and maintained by ensuring this accounting takes place?" This is not part of the remit of the Standards Committee. The Council is not party to the London Councils (ALG) Independent Panel on the Remuneration of Councillors in London. Barnet has its own Independent Remuneration Panel. Q2. "Public accountability of Councillors is surely an ethical issue that affects the Council as a whole. What plans does the Standards Committee have in order to ensure that Councillors account publicly for their activities, in this way to maintain high standards of ?" This is not part of the remit of the Standards Committee. The Standards Committee deals with Member conduct and ethical issues affecting the Council as a whole, it does not monitor Member performance nor Member accountability to their electorate. Q3. "Public accountability of Councillors is surely an ethical issue that affects the Council as a whole. When will the Standards Committee consider making a recommendation to the Full Council that the Chief Executive be instructed to publish Councillor attendance records on the Council's committee papers website (as many other Authorities do)?" This is not part of the remit of the Standards Committee. Details of Member attendance at individual Committee meetings are made available on the Council website when the minutes are published. Cumulative attendance figures are not collated, but anyone who has the time and inclination can do the calculations. By attacking my mother, instead of even attempting to address the points I raise, Amanda once again demonstrates that she and her overpaid friends are unfit to hold public office. Allowances and attendance figures for the House of Lords are freely available on-line, but unfortunately it is not possible to make a comparison with Barnet councillors who refuse to allow their annual attendance details to be published. So perhaps instead we could compare business acumen? My mother launched and ran a successful multi million Pound company which expanded into three countries, employed countless staff and generated enormous tax revenue for the Exchequer. She paid all her bills on time, never went bust, and never left a trail of creditors. 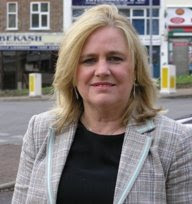 "Amanda" seems to be very close to the Tory Leader of Barnet Council. Yet again it seems that the barnet brand of conservatism is anti-inheritance, and anti-tradition. It seems they don't like the house of Lords. It seems that the only way they can insult you is via your mother. As a socialist, I'm also against the Lords, but I would never use a personal attack on someones mother to move my agenda forward. I would use arguments about the system. I think Amanda's comments are shameful. If I were Mike Freer I'd institute an investigation to see if the person was associated with the council and sack them if they'd used a council computer to leave it. Yet another shameful episode. I don't mind people criticising me in response to my criticisms of them. Indeed, I expect it. But the response of the Freer/Hillan supporters is always to attack my mother instead. In my opinion, “Amanda” is low life scum and I challenge Mike Freer and Lynne Hillan to publicly disassociate themselves from her comments. My mother has sat on numerous public bodies over the years including the Monopolies Commission, Crown Agents and was Chairman of Barnet Family Health Service Authority for four years. She was also Chairman of the 300 Group - an all party pressure group which promoted the advancement of women in politics. And she was a JP for 20+ years (now retired from the bench). None of these positions carried a salary. My mother, like so many of her generation, undertook these jobs out of a sense of civic duty. She was brought up to believe that we have a moral obligation to put something back into society. Freer, Hillan and their ilk are not fit to lick her boots. Rog, isn't it really terrible that there are some places that the Councillors are so out of touch that none of the voters will run to their defence. I think we are lucky in Barnet that they never have to resort to that and there are such a dedicated crew of well known publically identifiable citizens like Amanda, Do call me Dave, Julie and Jane etc who are there to defend them. Whilst the actions of the individual in the link I posted were laughable and inept, the comments we see on the Barnet blogs is something rather more unpleasant. I suspect that some of the individuals leaving these comments have dealings with Davids mother through their political engagements. Would they repeat these comments to her face? I'm not sure which word best sums them up - Spineless, Useless, Witless. I was having a chat with a local Tory activist in M&S about this earlier today who follows this blog (and mine)"I know what you are going to say. Yes it's pretty out of order". I asked who he thought who left the comment. He rolled his eyes and shook his head "Lets not go there". Yes, but I doubt he will do anything in his Association. Trust me that I have seen there nastiness up close. I've detected a shift over the last six months. In the summer I'd be greeted jovially with a sarcastic comment about my latest blog. These days I just get a resigned shaking of the head. I suspect that the local Tories still like Boris and Dave, which might save them. There is no enthusiasm for the lot in Barnet though. Six months ago, no local Tory would have said "You've got a point there" Now I hear that phrase all the time.